Our Lord appears to Valerie when and where He decides to. 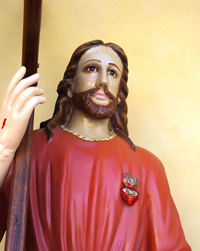 From 1998 – 2000 Jesus has appeared to Valerie twice a month, though since 2001 up to 2008, He has been appearing once a month to Valerie for a period of approximately 25 minutes. In 2009 and 2010, Jesus appeared to Valerie every 2 months. From 2011 un to now Jesus has been appearing every 3 months. Every apparition of Jesus feels like it’s much longer than it actually is. In recent years the Lord has told Valerie, that He will appear to her between the 23rd through 25th, though before His Mother appears to Valerie. Before, because He will give her strength for Her next message. He says, ”Do not forget that everything we bring is from Heaven. I know that you will get a lot of problems with clergy and the bishops, but don’t be afraid, because everything has bloomed. Since all that is Mine, will never end. One thing they can think of is that what you are doing can break the religion, but this is not correct. You bring the best apparition on an island that has lots of problems. What has saved this island is that there are many people praying. The Lord has told Valerie He would stop appearing to Valerie in 2001, but He decided to continue up to now, due to the situations the world is in and the guidance the Visionary needs from Him to give to the world. His messages are becoming more and more heavy and important to this world. He has a brown beard and mustache, though a very small cut – not long,, as usually presented in pictures. Jesus is more beautiful than handsome, actually beyond description. It’s an inexplicable beauty. See pictures of the image of Jesus here. 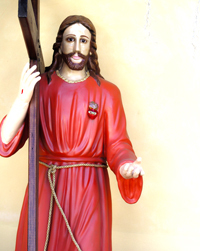 In His apparitions, He always appears with different clothing and comes with different rays and colors. He has also appeared with a long stick in His hand. His clothing has varied from brilliant white, light yellow, white with an additional red robe, light blue. He comes with lots of rays of light of a brilliant white color – all the rays mean life that has to continue. Jesus appears bare feet or with open sandals. He wears no jewelry of any kind, but dresses rather plain. Jesus appears unexpectedly and sometimes Valerie doesn’t have the chance to kneel immediately, but then kneels after He has appeared to her. At Modanza in Valerie’s room, in the chapel, in the porch outside the kitchen, beside a coconut tree in the garden, near the washing machine outside, in the kitchen. At the house where she is living now, in the terrain right beside the house, in the front of the house, in the small room inside the main house, behind Valerie’s house, near the dogs, in the washing space, etc. At Koyari in the Chapel on top of the altar, under the large tree behind Mother Mary’s image, on the Cross, near the arch in the middle of the terrain. 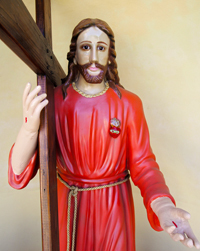 A very important apparition of Jesus Christ at Koyari was in March of 2000 – 5 people were present. 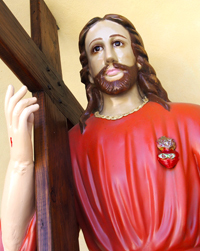 Valerie felt that Jesus was coming to Her and she went to Koyari, as He told her (only a few times He has told her the date and/or time of His apparition) that He would appear that day at 2.30pm at Koyari in order to give strength to everything that needed to be done here. This is what He told her in February of 2000. In this apparition, Jesus came embraced in transparent rays looking like crystal together with St. Michael Archangel and St. Raphael and more angels around him. These two angels put the palms of their hands together and bowed before Jesus saying “Master, do what you came to do.” and the two angels elevated towards the other angels staying above. Jesus said “Now many things will happen. In a few minutes many will see and Aruba will feel. I will change the light of day into darkness. You will see me do this and all will know how much Power I have.” He gave Valerie the message He brought for her that day. He raised His right hand up to the sky and waived it into a circle and put His hand back down. The two angels came down again beside Him, bowed in front of Him with their arms crossed in front of their breast and They all elevated together. The weather changed immediately. Valerie was on the terrain, she felt a strong wind, the weather changed (from sunny sky and warm wind, it changed into a dark sky and cold wind). The Visionary was awestruck and went to the people present to explain what just happened. Valerie said that she was very happy that Jesus could show those who were present how much Power He has in such a small amount of time. The weather changed instantly when He waived His hand. No second was permitted in between. How great He is and how quick He can do things, because He is God. Valerie asked if they now understood that He is God and that He can do anything. 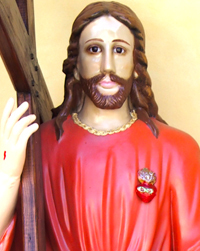 As Jesus appears in Aruba, under the name Jesus our Friend and Savior, at the same time He appears as the Suffering Jesus. Why? “You all know why, because after all I ask of you, you still don’t want to understand Me. 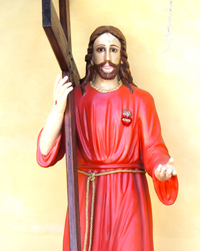 This is why Aruba will get My image, as I appear, so that the world can see Me.” The Suffering Jesus appears in a light red/orange robe, with a yellow curved thin stripe coming from His left leg towards the right of His waste. The red/orange means that the world will end in flames, because of our mouths – we say things that should not be said. Jesus says that there are so many beautiful things that can be said and are not said. This yellow stripe means the way He walked for us on this world. His heart is partially visible and out of it curved rays of light, meaning “The new life that many of you will see and live in – a new era, where I will never be crucified again, I will be free with you and evil will never get in your way again. This new life will not include evil, only goodness and love. “Listen to Me, Aruba, this is how My clothing looks like. Now you understand it all. Better believe without seeing. Walk ahead and please forget all that happened in your past, because all forgiveness that you asked for has been given, such as, drug addiction, alcoholism, a life in sin, live to live – but still I have forgiven you. Isn’t it beautiful that I still forgive you? Say “Yes”, that you accept Me. There are many ways to make yourself happy. Do you know how? Of course! Work for Me. Thank you and thank you a lot to respect My Word.” (private message of December 2001). During His apparitions to Valerie He provides her with strength to preach His word. Jesus tells her “I like how you preach, because I have offered it to you. Fast, complete as I want it. Because when I do something, I do it right away. That is why I want all My servants to work the same. Without papers, the knowledge comes from the Holy Spirit. When the Holy Spirit enters you, you will not be tired of preaching. And this is what? It is because of your faith that it has given you progress. This is why I ask to always do good to one another. I don’t come for nothing, but to help you all who need My help. Remember that the biggest Saint is Saint Joseph, who is the greatest of the world who many need to follow and pray to, because he has taught me everything I know” from My Childhood. When I was younger, My Mother and My Father, of respect, St. Joseph, had problems so why wouldn’t you have problems? You should be happy that you believe without seeing, because there are miracles every day. If you see that all is good during an apparition and you believe in the miracle and in the message, you will receive even more blessings. Why? Because you know that that place is a good a place, where you will find the help you are looking for. Put your trust in Jesus and He will always remember you. Get out of your house, wherever you are on this earth, and talk to Him – He will talk to you in your heart, accepting you. He loves chocolate. He likes people to give each other chocolate. On a saturday in 1998, the Visionary had a prayer session at her house and a woman came with two packages of chocolate for her. But there were lots of people at my house. I opened the two packages, every package had 12 chocolates. I poured them in a glass bucket and I asked myself how everybody could get a chocolate or only the children. The packages were brought from Colombia and it’s a brand that is not sold in Aruba. When I went into my room to get the chocolate, in front of the woman, someone who has a Divine Child devotion, who brought me the chocolates, , there were suddenly so many chocolates in my room, that there was no place to put more … I screamed “It’s a miracle, it’s a miracle!” I told the people outside “See how Jesus gave us more chocolates!” I gave all present a chocolate and there was plenty left. I was shocked and I ate 5 chocolates myself. I was saying to myself “This is incredible! Jesus… thank You!”. For me it’s the greatest gift and the greatest privilege. When Jesus decides that He will not appear to me any longer, then it will be His decision. It will be hard for me, but I will learn to accept His decision and His absence. 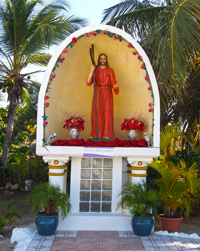 For His apparitions in Aruba, He will always be, Jesus our Friend and Savior.